I Love Dogs and Animals | Animal Rights Activist too! An argument over dog waste results in threats between neighbors so police were called. Then SWAT was called when one of the parties barricaded himself in his house. 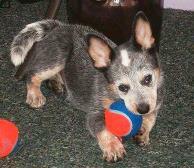 His little dog runs outside with wagging tail and the SWAT team shoots & kills Angel the dog. They shoot with those massive rifles, twice. Police say it was an unnecessary distraction? Murdering “unnecessary distractions” is justified? I SAY THEY KILLED A DOG! HUMANS MUST PROTECT ANIMALS. This is a case of firstly people do not recognize the value of life, especially animals. 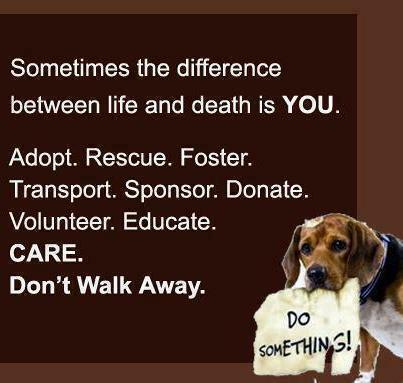 The number of animals, and “pets” killed through neglect, abandonment, cruel intentions and police is massive. Maybe people can’t grasp 2.7 million, of course it could be because we lack humanity. So what if they saw 20 dogs or cats in one room, had to watch “being put down” – which is murder. Would they change their mind? This dog should not have been shot. If a toddler came out of the door smiling, would they have murdered the child? What if the toddler came outside screaming, crying and growling because she was terrified. Child, dog, cat, guinea pig, rabbit, rat, sparrow – they should not be shot and killed. Which brings me to point two. Police cannot use the excuse of fear for their life or distraction as a reason to kill. Do not get me wrong, I know that there are many men and women police officers that work hard, put their life on the line and protect & serve. But governments & police departments must screen all applicants. Or do a better job screening. And they need improved ongoing training. Incidents like this would not happen if the right people with the best training were involved. Read an article by Frank Serpico in Politico Magazine to learn more about helping law enforcement. And America must stop portraying the any means necessary law enforcement movies & TV. Any means is not necessary. The right, humane and lawful means are necessary. 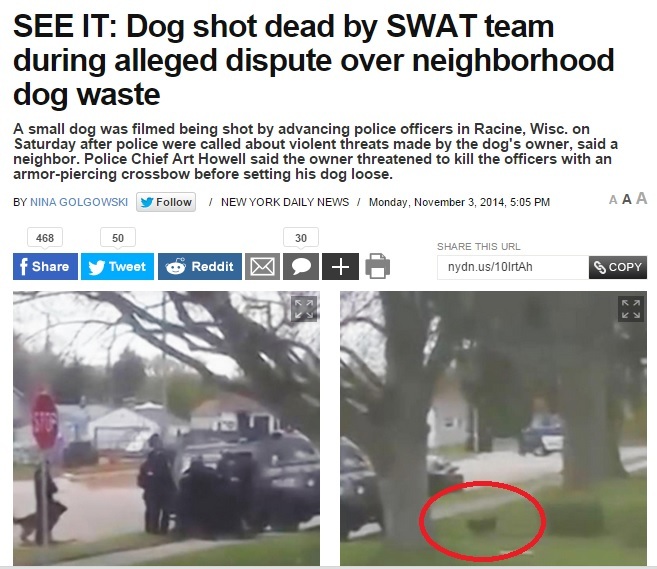 What is also appalling, that news articles say “Watch SWAT Shoot a Dog”. Like wow, this is cool. It is not cool. Informational and a tool to help bring change, maybe. But don’t display as entertainment. I am saddened, disgusted, appalled and angry. BE THE CHANGE! Pick a charity, so many are worthy and donate. I have listed some below. And just as important – SPEAK UP. If you see any animal abused, report immediately to local animal control or ASCPA or HSUS or PETA. Animal cruelty is not just cats or dogs. Other animals we are guardians of: birds, rabbits, guinea pigs, snakes, mice, lizards, turtles, all in our care. I do not eat meat or wear leather. I try to live my life cruelty free. If you cannot make this vow, please make a vow to fight all cruelty. Why do we allow animals to be terrified, tortured and treated so abysmally? Why? Is it because we are unaware or out of sight so we don’t act. Watch this video and lend your voice, donations and actions put an end to this inhumane behavior. I AM SCARED AND I DO NOT WANT TO DIE. Yes it is the dog days of Sunday here. The weather is nice so the back door is open. And three of the doggies are laying in front of the open door, two are sleeping but Chester is checking out the goings on in the backyard. 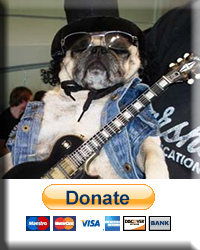 We are checking are calendar to see if we are free for DFW Pug Rescue‘s fun fund-raising event – the Annual Pug-O-Ween. 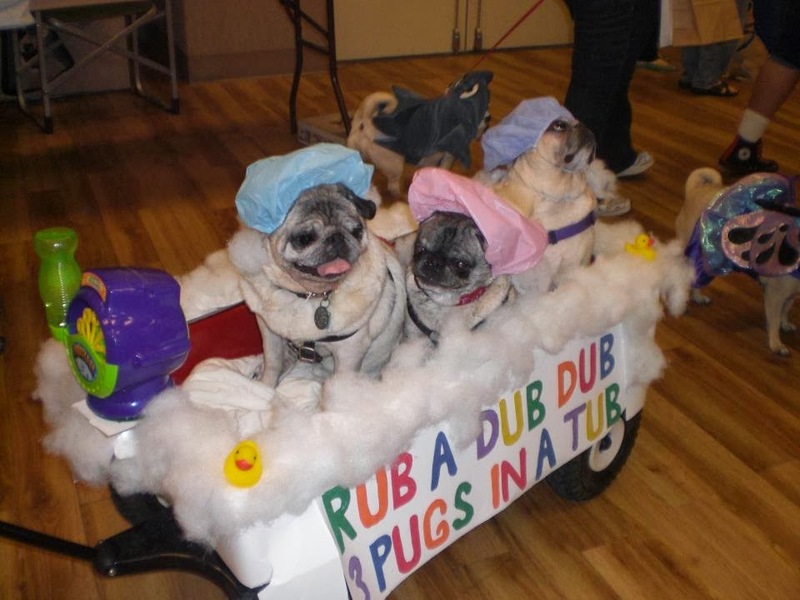 October 26, 2014 is the 18th Annual Pug-O-Ween. 11 a.m. to 4 p.m at the Grapevine, TX Convention Center. Admission price is $8 for adults and $4 for children. 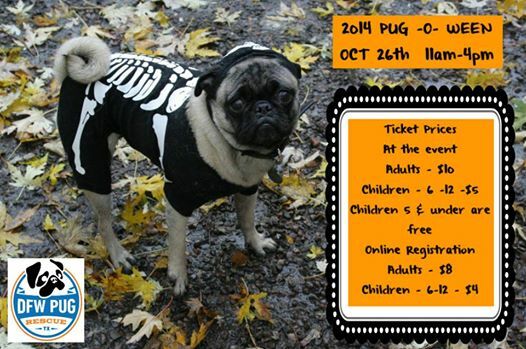 Come see the fun, enter your animal family (doesn’t have to be a pug) or come adopt a deserving, loving pug. This year we are in limbo, so we can’t contemplate participation or making costumes. The foster pug and bug are disappointed. Okay the Bug, Ambrosia – pug and boston terrier is Not disappointed. She has seen my posts of doggies in costume, she is not a fan. But Pippa (aka Madlina in pug rescue records) is disappointed. She wants everyone to know that she is cute and that her collapsing trachea isn’t holding her back. 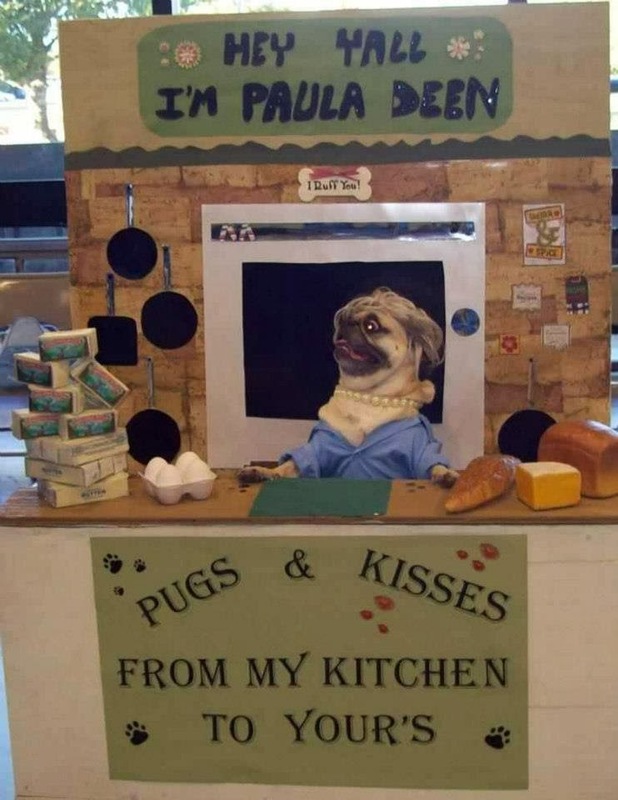 And she wants to meet Couch, a special needs pug with the same issue. Couch is adorable and needs some donations to help with her medical expenses. 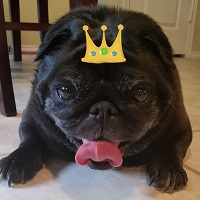 Here is a darling pug that needs a forever loving home, Hula. Meet Hula! She is a little Hula girl. She is around 7 years old. She dances around waiting to find you. She is an absolute little doll. She had a very bad life of being a breeder girl and that life is now gone forever. Her little eyes were so damaged and blind that they had to be removed. She is a trooper and is recovering great. 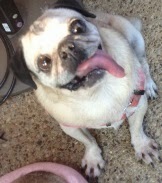 Thanks to DFW Pug Rescue for saving Hula and her friends. 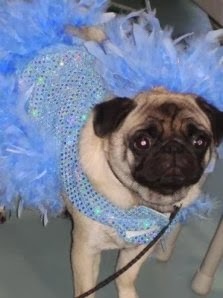 She is available for a forever home and you can inquire at www.dfwpugs.com. 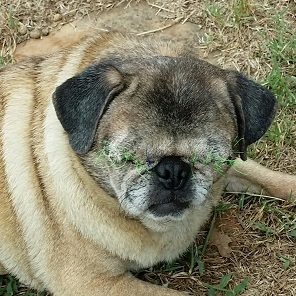 You don’t know what you are missing until you own a blind pug and welcome them in your home as a new family member. Most rewarding experience ever!! I have to go – Someone just let out the alert that they have seen a squirrel. Everyone is answering the call to duty (except the parakeets). We must make the yard safe for caninekind. Happy trails and tails.